Recently I was given a few books and some were about diving. One book that really caught my attention was Shadow Divers, written by Robert Kurson. The book describes how two New Jersey divers discovered an unidentified U-boat from World War II. 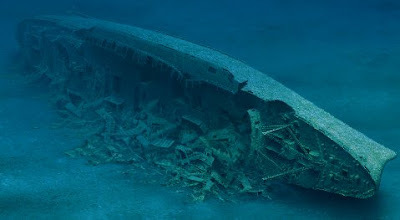 They realise that it has to be a German U-boat but it takes them 6 years to discover the identity of the wreck. Small detail is that the wreck had come to rest at 230 feet or about 80 meters depth. Not a depth that your average recreational diver visits too often, actually never. Three divers lost their lives over the six years of exploring this U boat wreck. To go this deep, it takes a special kind of person, to go there on a regular base, it also takes a very determined person. Especially considering that back in the days when all of this was happening, in the early ninetees, Trimix as widely used nowadays, was either not available or in it's infancy states, to be used and experimented with during their last seasons diving the U-who, as they dubbed the boat. It is well impressive how the "Drums of the Jungle" are described, everybody who has experienced Nitrogen Narcosis knows what I'm talking about and for those who haven't, I never saw a better description of this phenomena. After six years they finally could reveal the identity of the U-who and it turned out to be the U-869. I can highly recommend visiting Richie's website dedicated to the U-869. The two divers are John Chatterton and Richie Kohler. Richie generously allowed me to use pictures from his website. Thanks for that! The story is amazing and an absolute must read for divers at any level of training but especially if you're in to wreck or tech diving or generally interested in WW II artifacts and stories. Dan Bartone, one of the participants of this trip, holding the telegraph of the Akela, a wreck recently discovered in the Gulf of Thailand. 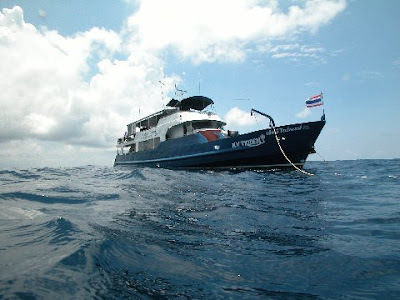 Just to show how small this world can be, Jamie MacLeod who was my PADI Course Director a couple of years back, is diving the Gulf of Thailand with his boat the MV Trident since a few years and they made a similar discovery right here in the Gulf of Thailand. Jamie and Stewart of the MV Trident discovered a US World War II submarine, the USS Lagarto. It didn't take too long for John and Richie to hook up with Jamie and Stewart. Richie came to Thailand during April 2008 for a wreck expedition with the MV Trident and they discovered 3 new wrecks during this trip! 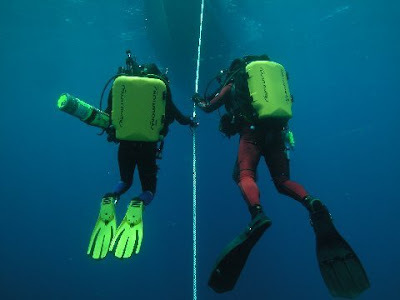 Note the closed circuit rebreathers that both of them are using, a feat that almost every current wreck and tech diver uses, due to the amount of time that can be spend at significant depths underwater and the decreased decompression stops required during ascents. The costs of Helium are also minimal compared to what open circuit divers use. Jamie offers plenty of Technical courses in case you're interested and you get the bug! Besides having discovered the U-869 and diving in the Gulf, Richie Kohler and John Chatterton have also dived extensively on the SS Andrea Doria, another famous wreck off the New Jersey coast and a wreck that claimed up to 15 divers lives up to date. They have a rich diving history and it's well worth to check out their respective websites for more details. 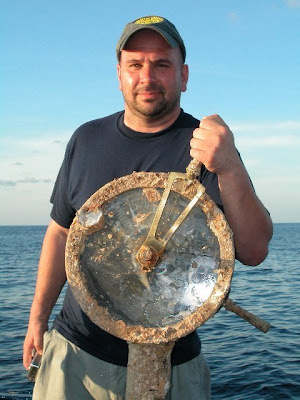 On that note, a very informative website about wreck diving in Thailand is Steve Burton's Thaiwreckdiver site. 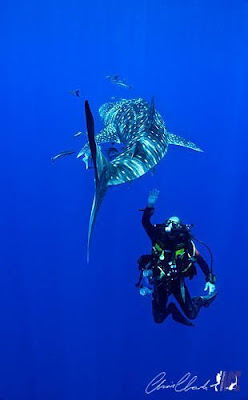 Here a rather a-typical tech/deep wreck dive, Richie Kohler together with a Whale Shark during one of his safety stops. Usually this kind of tech/wreck diving is done in places with limited visibility, at great depth, exceeding recreational diving limits and it requires adequate training, so make sure you get the appropriate training before you venture out on any wreck dive adventures!